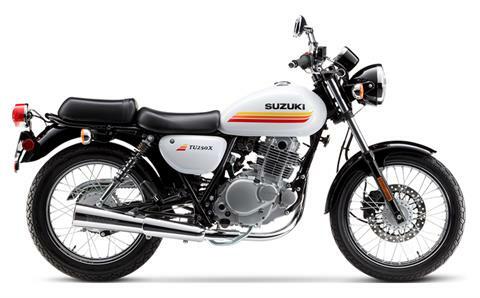 Two-piece rider and passenger seat further emphasizes the bike’s classic look. 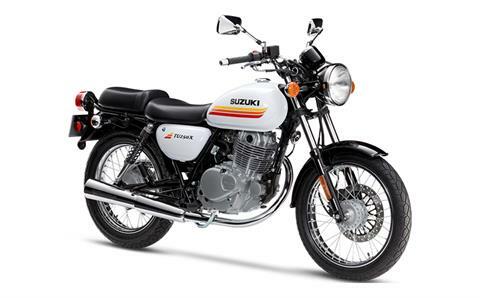 249cc, air-cooled, four-stroke, single cylinder, SOHC engine with Suzuki's industry-leading fuel injection system is tuned for strong low-end torque that’s well-suited for city riding. The single cylinder engine, with prominent cooling fins and chrome megaphone exhaust system, is matched perfectly to the bike’s classic styling. The engine’s richly polished crank case covers produce a beautiful, high-quality look. Two color schemes complement the bike’s classic sports appeal – Glass Sparkle Black paint with graduated blue stripes and Glass Sparkle Black/Pearl Glacier White paint with yellow, orange, and red stripes.